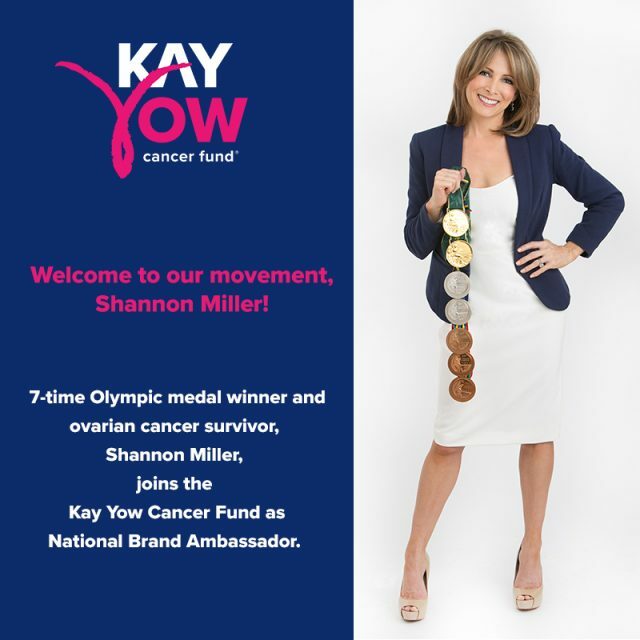 Raleigh, NC (November 15, 2018) – The Kay Yow Cancer Fund® announced 7-time Olympic medalist and ovarian cancer survivor, Shannon Miller, will join the Fund as a national brand ambassador. Miller, who was diagnosed with ovarian cancer in 2011, has been an advocate for increasing funding and awareness for all cancers affecting women. The Kay Yow Cancer Fund was founded in 2007 by its namesake, Naismith Memorial Basketball Hall of Fame and Olympic gold-medal winning coach, Kay Yow. The Fund focuses on raising money in support of ALL women’s cancers through research and programs that serve the underserved. “As a cancer survivor and as a mother, it is so important to me that we do all we can to ensure that future generations do not have to face the harsh realities of cancer. The Kay Yow Cancer Fund is making a difference in the fight against cancer for all women and I am excited to be a part of funding life changing research and helping those facing this battle,” said Shannon Miller. To date, the Kay Yow Cancer Fund has awarded over $6 million in support of ALL women’s cancers through research and programs that serve the underserved. The Kay Yow Cancer Fund was officially founded on December 3, 2007, from the vision of the organization’s namesake Kay Yow, Naismith Hall of Fame and former NC State University head women’s basketball coach. Coach Yow was first diagnosed with breast cancer in 1987 and battled the disease over the next 22 years before passing away on January 24, 2009. The Kay Yow Cancer Fund is a 501 (c)(3) non-profit organization committed to being a part of finding an answer in the fight against women’s cancers through raising money for scientific research, assisting the underserved, and unifying people for a common cause. To date, the Kay Yow Cancer Fund has awarded over $6 million in support of the fight against all women’s cancers. For more information on the Kay Yow Cancer Fund or to make a donation, please visit www.KayYow.com.